Featured in Michael Fremer's Heavy Rotation in the August 2011 Issue of Stereophile! TAS Harry Pearson's Super Disc List! Stereophile Magazine The Very First Title Pressed at Quality Record Pressings Is... Cat Stevens' Tea for the Tillerman! 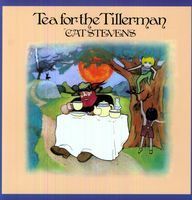 One of the all-time most classic audiophile records is Cat Stevens' Tea for the Tillerman from 1970. There are so many things perfect about this release. First and foremost, it's a masterpiece of a record. It's that rare record that couples breathtaking sound with hit after hit after hit. In fact, to list the hits would be to list the entire song list. Quality Record Pressings couldn't have picked a better vehicle for which to show off what will be one of the highest quality records ever pressed! The Absolute Original Analog Masters were used, and the tapes were in impeccable condition! Using a Telefunken M10 tape machine and a Neumann VMS 66 lathe with a Neumann SX68 cutterhead. Hulko started Sterling in 1968 and was its original mastering engineer. He's considered among the first engineers to advance mastering from just transferring music from tape to lacquer to an art where attention is paid to all the details that result in better sound. Hulko's original mastering notes were also found from more than 40 years ago!!! It's incredible, but Sterling still has all of their notes filed away. So, this album was originally cut at Sterling - as were all of the early original Cat Stevens albums - and the tapes were last used at Sterling. How appropriate then that Quality Record Pressings should go back to Sterling for this monumental reissue. Using the original tapes, George Marino handled the mastering this time. He used an Ampex ATR-102 tape machine, another significant point of interest. While Ampex has long been revered for their sound, they had never made a preview version so that a mastering engineer could cut a lacquer from an Ampex machine. Mike Spitz at ATR Services made a unique preview modification for Sterling so that they could cut this record using an Ampex. Marino then used a Neumann VMS 80 lathe with a Neumann SX 74 cutterhead. Fremer Rated 10 out of 10 for Music, 10 out of 10 for Sound!